1lb 9oz Yes free delivery when your shopping basket total exceeds our free delivery limit ! 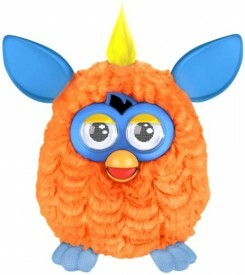 Buy the new interactive hot orange Furby furry toy with blue ears. By Hasbro makers of the interactive toy your kids will love.. The clever way in which Furby has been made in this new generation of cuddly Furbys is that its far more interactive with its environment than its previous furbys were. For a start you are given the ability to download an iphone app from the apple store or for your Android phones from the Google play store. How ingenious is that.. We think its a fantastic step in the Furby evolution. Using your mobile you can feed your Furby or access its translator. The Furbys talk Furbish of course but the translator allows you to really understand how your Furby is communicating. Every where you look you are incouraged to put your Furby in front of the tv, computer or listening to your music and watch it react. Your new Furby is designed to react with whats going on giving this unique toy the TrustMum thumbs up. So the question you are given to think about is "what will your Furby become?". Make a Furby your own by purchasing with us today. Ages 6+ Manufactured by Hasbro. Required 4 x 1.5v AA batteries which are not included. Speaks Furbish and English includes translator dictionary by download. Available in many colours, but colours may vary very slightly from Furby to Furby.